In January, Barbie launched their #TheDollEvolves campaign and a new Fashionistas line of dolls featuring more diversity in hair colors and styles, skin tones and body type. The new line was a huge step for not only Barbie, but also in the body empowerment movement that so many women are partaking in. The new doll was featured on the cover of TIME magazine and had social media buzzing. The new dolls are inspiring girls everywhere to embrace their bodies because the dolls they play with will look just like them now. The dolls send such a great message: Target is making them come to life to inspire not only young girls, but women everywhere. Everybody knows the dread that comes with swimsuit season both in and out of the store, but Target has tried to eliminate some of that dread by making every woman feel comfortable in their own skin while shopping for and wearing a bathing suit no matter their size. Last season, they launched their “Target Loves Every Body” campaign which turned out to be extremely popular. This year, their campaign is the #NOFOMO (no fear of missing out) swim campaign, which is encouraging women to embrace their bodies, rid themselves of insecurities, and enjoy the swimsuit season without holding back. So, they have decided to pair up with Barbie this year due to the huge strides they have recently made in body positivity and embracing diversity. Target designed several Barbie-sized versions of their actual swimsuit line and used the new Tall Barbie, Petite Barbie, and Curvy Barbie with various hairstyles and skin tones to model them. Barbie posted the shot on their Instagram. The swimsuits are not for sale in Barbie sizes, but who knows what will happen as the Target’s campaign takes off and the body positivity movement keeps charging ahead. The new Barbie dolls and Target’s swim line are currently both for sale in Target retail stores. 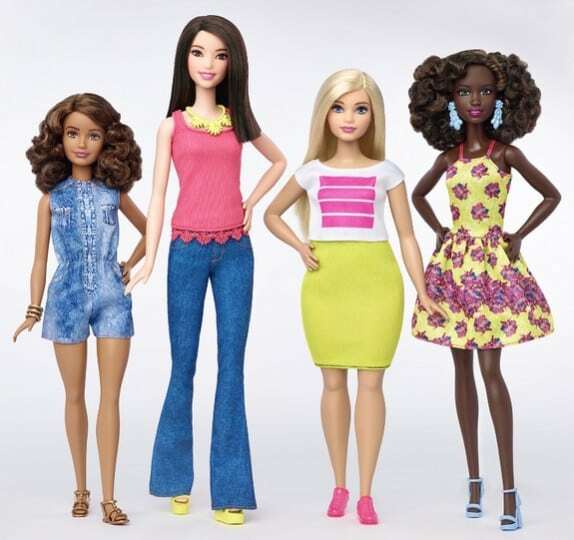 Target and Barbie are doing what they can to empower women everywhere to feel comfortable in their own skin. More plus-sized models are taking a stance on this issue, as well as traditional models, and women of all sizes, shapes, and occupations. Hopefully, more companies will be inspired by Barbie and Target and pave their own way in this inspiring and needed body empowering movement.